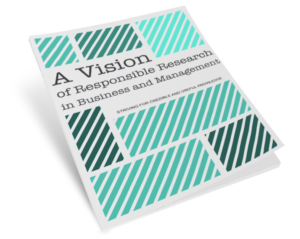 We are pleased to announce the second annual Responsible Research in Management Award. We would like to invite you to nominate recent empirical research papers or books that you’ve found exemplify rigorous, credible and useful research into society and business’ greatest challenges. In our second year of this unique award, we’ve expanded our review process; in addition to an assessment by highly accomplished scholars, we have an additional review by senior executives at leading global companies. We’re excited, through this award, to identify exemplars of research studies that build strong links between practice and academia toward better outcomes for all of society. Details of nomination criteria and nomination process can be found at either www.rrbm.network or www.iacmr.org. You will also see the list of top-notch reviewers on these websites.